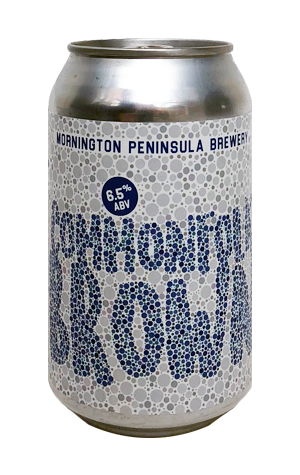 Mornington Peninsula Brewery and near neighbours Commonfolk Coffee are regular customers of each other and have been known to combine the fruits of their respective labours in the past. And here they're at it again with the release of Commonfolk Brown in cans. The easy assumption to make would be that the co-conspirators have taken the Brown Ale of one and infused it with some coffee from the other. But this is a rather different beast, with raisins and vanilla added to the mix too, pushing the coffee down the pecking order in terms of impact. It's a gorgeous looking beer – an austere mahogany hue – and serves up soft and pillowy aromas of chocolate, cocoa and vanilla with just a hint of the coffee. Whether the dark fruit characters are those you'd expect in this sort of beer or enhanced by the raisins, who knows, but they're tucked in alongside plenty of rich toffee in a beer with an intensity that lets you know this is a step up in ABV from the brewery's straight Brown. If you need extra enticement, the coffee featured comes from the Zukuka Co-op in Uganda, which helps support 20,000 farmers and families in East Africa.